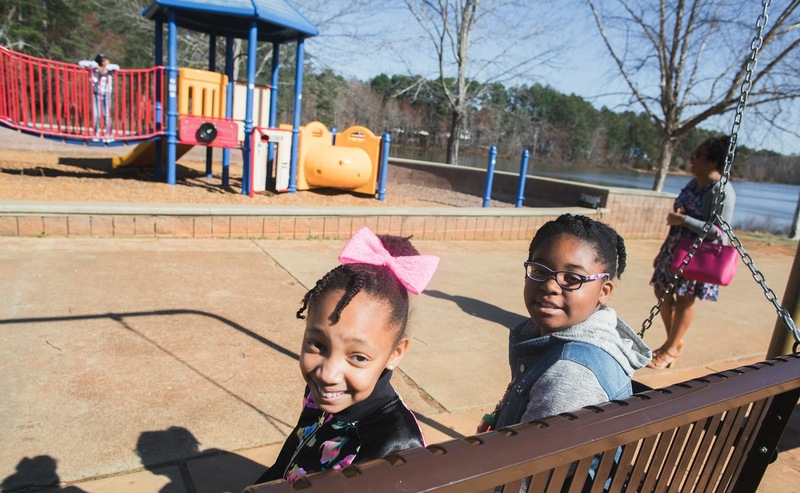 I was born and raised in Northern California, and now reside in Greater Atlanta Georgia area with my two teen girls and high school sweetheart. I started Product Review Mom blog back in 2013 as a hobby to document products I've tested out, and now it has turned into a full-blown, full-time business (LM Marketing, LLC), sharing my thoughts and opinions on a variety of different things and topics I enjoy in life like beauty, travel, fashion, entertainment, food, cars, Atlanta, money-making opportunities, and more! I partner with brands to help get the word out about their awesome products! You'll also see my daughters hanging around with me sharing their opinions as well and working behind the scenes. It's a family business! Product Review Mom has sky-rocketed to heights I couldn't imagine, being featured in top publications like Dr. Oz, The Good Life, First for Women's, and Womans World Magazine to name a few. I've worked with leading name brands and small businesses getting the word out about their latest products and services, and my readers and followers look forward to what I have to say. My posts are engaging with no shelf life because my articles rank well with search engines with posts performing well for years giving my clients a return on their investment! I would love to partner with your brand! Let's get to work! Contact me for media kit and rate sheet. I was in The Rock Ranch Promotion Video by The Rock Ranch. Quoted along with over 90 other women entrepreneurs on LaunchGrowJoy.com. 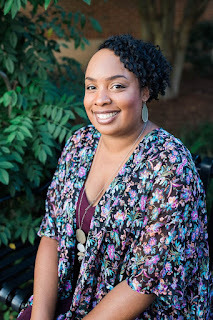 I was listed as Atlanta's African American Bloggers You Should Know on BernettaStyle.com. Quoted on Insuremytrip.com about travel bloggers secret to success. 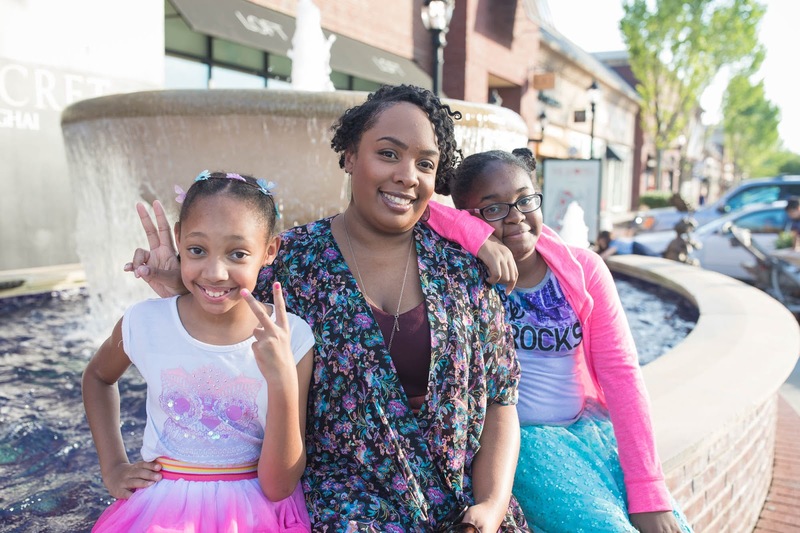 Featured on ForHarriet.com about 10 Awesome Black Mom Bloggers to Follow. My blog post was mentioned on Successfulblogging.com. Featured on TheWorkatHomeWoman.com about How to Make $1000 a Month Working from Home. 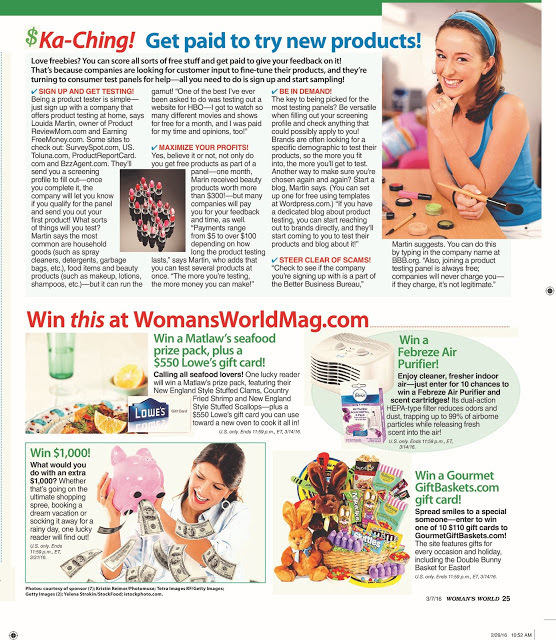 Featured in Woman's World Magazine March 2016 Issue, about getting paid trying new products. Thanks for the info. I have enjoyed reading about your lovely hobby and look forward to "product reviews. Just beginning. Willing to accept all knowledge. Enjoy your day! Thanks for stopping by and enjoy your day as well! I think the only way for you to test products is to become a blogger and contact companies you're interested in directly. Hey there Lou, I like the name. I am also a product reviewer and been featured on a few sites I haven't been blogging nearly as long as you have. I found a few of the places you listed to get product helpful. I'm on most of the places you listed I tried to comment with a thank you but I wasn't signed in and couldn't comment. So thanks for sharing it is always fun to meet other people who blog and review products too. Thanks for stopping by Sabrina! I stopped by your blog as well! Loved reading about you louida me and you both have the same ambitons your blog is inspiring to me even when I live so far away in Australia. I enjoy reading your blog I too have been considering starting a blog you inspire me I see I've got so much to learn, I love being creative, doing research on the Internet and love to write hopefully I'll be able to ask for your advice and tips when I get started on my blog. Thank you in advance Lou. Welcome to the world of blogging! It's a lot of fun, I get to learn about different products, companies, meet new people, even earn a living from it. It's hard work, but since I'm so passionate with what I do it keeps me going. Email me when you need help.